Looking for its next class of future entrepreneurs, the Wolff Center for Entrepreneurship is holding a forum on Sept. 7, where students will learn what the program offers and more. Want to be your own boss? Students and alumni from the Cyvia and Melvyn Wolff Center for Entrepreneurship at the University of Houston C. T. Bauer College of Business have gone on to open successful ventures, from restaurants to pet apparel companies and just about everything in between. The Wolff Center is looking for its next class of future entrepreneurs and on Sept. 7, will host a forum from 4-5:30 p.m. in Melcher Hall Room 160 for prospective applicants to ask questions and get more information about the program. Students will be able to ask questions regarding the application process, criteria for selection, what the program is about, and what it offers to students, and more. “We are hoping to get all students interested in learning more about entrepreneurship, whether it be Bauer or across campus in other majors,” said Viviana Vargas, a coordinator for the program. The forum will be lead by WCE associate director Ken Jones, marketing & entrepreneurship academic advisor Asha Thomas, Vargas and several current WCE students. 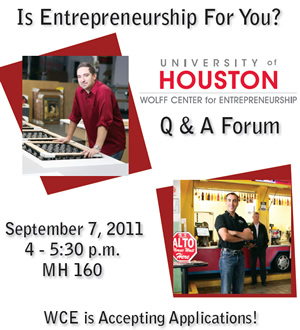 For more information on the Wolff Center for Entrepreneurship, click here. Who Did WCE Students Hang Out with in Omaha?